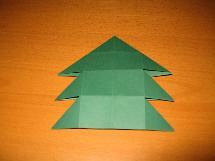 Use a sheet of green square paper and fold it diagonally. Cut it through the middle. 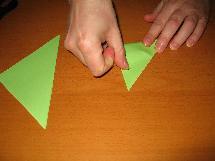 Lay one half aside and fold the other half again so you’ll get another triangle. 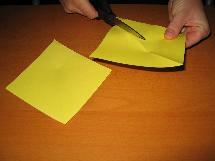 Repeat this until the paper is to small to cut. Cut a stem from brown paper. 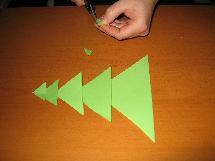 Start by pasting the biggest triangle on the stem. Work your way up by using the biggest triangle until you run out. 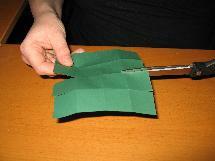 Use a sheet of green squared paper and fold a kite (see the how-to page about folding). 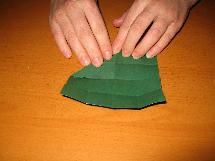 Fold the small tip inwards. 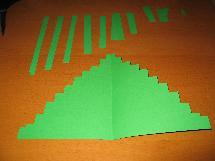 Cut 10 strips of paper. 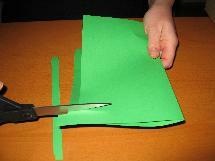 Start with the longest strip of paper and paste it on the stem. 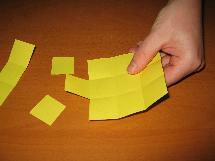 Take another strip of paper and cut off a piece. Leave a bit of space open en paste it above the longest strip exactly in the middle. 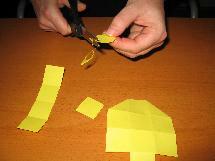 Take another strip and cut it smaller than the one before. Repeat this until you have 10 strips. 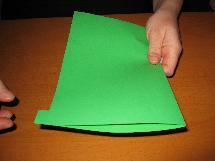 Use a sheet of green A4 paper and fold it. Cut a strip almost to the end. Repeat this and stop 1 cm before the end each time. 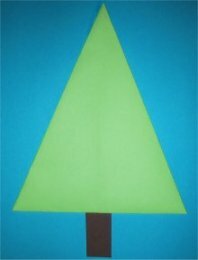 When you’re finished open the paper and your tree is ready for decorating. Use the leftovers from the project above. 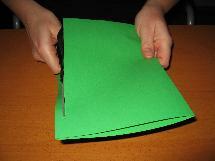 Then, find two strips of paper slightly shorter and paste them on either side of the longest strip. Repeat this until you have 5 strips on each side. Cut in on the sides twice, repeat on other side. 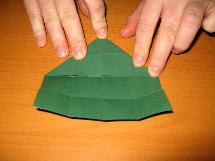 Fold the top to the middle. 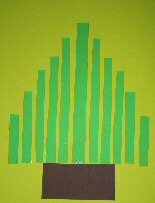 Cut a trunk, paste the tree on the trunk. 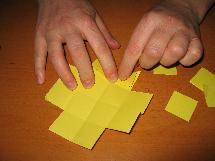 yellow square paper in the sizes 12 x 12 cm, 10 x 10 cm and 8 x 8 cm. You could also use golden square paper. 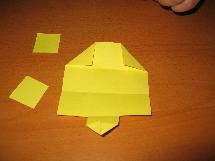 Fold 16 squares. See the how-to page for instructions. 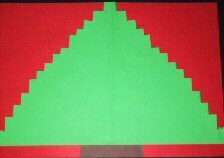 Cut off one row of four squares. 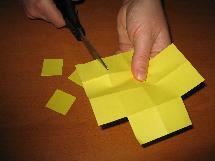 Then cut another 2 squares off, but leave the one in the middle. On top of the bell, fold the edges inwards. 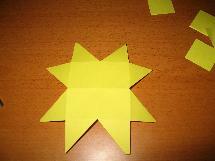 Fold the middle square inwards as well. 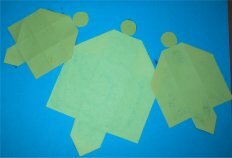 Use the leftover squares to cut a small circle and paste it on top of the bell. 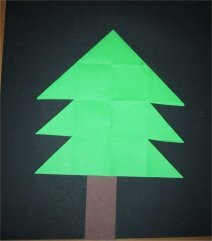 Do this with all sizes paper and the project is finished. Step 6: Your bell is finished! 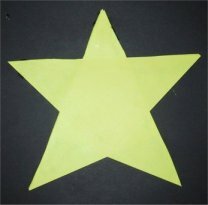 yellow square paper size12 x 12 cm. 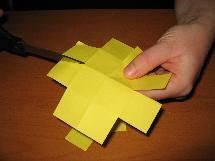 You could also use golden square paper. 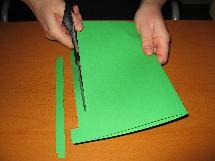 Make incisions in the middle of all four sides. 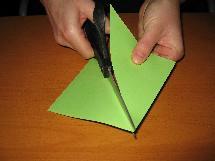 Fold the inside corners away from each other into triangles. 2 yellow square papers size 12 x 12 cm. You could also use golden square paper. 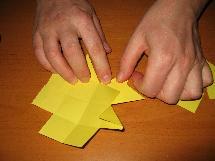 Fold the 2 squares diagonally. 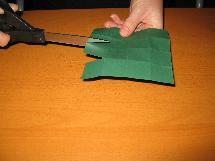 Cut them over the folded line. 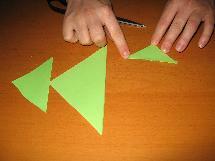 Take 2 triangles and make a big triangle out of them. Lay them over each other so they have 2 “legs”. 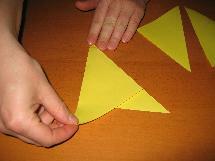 Take another triangle and lay the tip between de legs of the first 2 triangles. 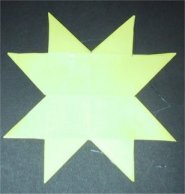 One triangle remains unused, but if you take another square paper and repeat the steps, you can make another star and the paper won’t go wasted. 4 yellow square papers size 10 x 10 cm. You could also use golden square paper. 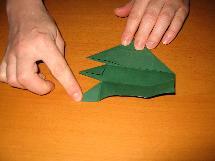 Fold 4 kites, see the how-to page about folding. Lay the tips of the short ends of the kites against each other. Lay the tips of the short ends of the kites against each other. This is the same as shown in the project above. Lay another 4 kites over the already pasted kites. brown square paper size16 x 16 cm. 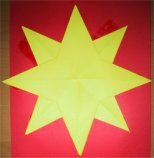 any colour square paper size 8 x 8 cm or 10 x 10 cm. 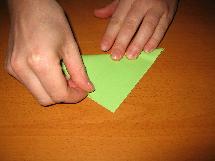 Fold the brown square paper diagonally and cut it on the line. 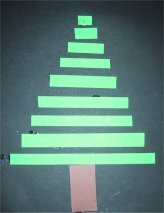 Take any colour square paper and fold 16 squares. Cut it trough the middle so you’ll have 8 squares left. 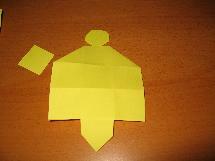 Fold one corner in and make a circle for a face. Repeat this to make the other character. 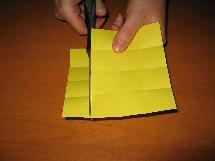 Use two small brown strips and place them diagonally across each other. This will be the crib. Place some straw in the crib for authenticity. 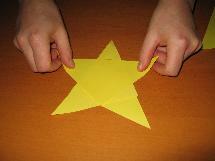 Stick some stars on the paper and you’re done. Put all the colours paint on plates. Stick the child’s hand in the blue paint. 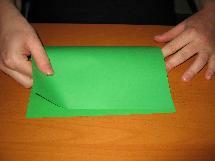 Place the hand on the paper and tell the child to wiggle her fingers. Let the child was her hand in the bucket. Stick the child’s hand in the white paint, but not completely, just the top of the palm and the fingers. 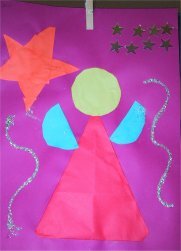 Place the hand on the paper and make the wings of the angel. Let the child wash her hand in the bucket. With their fingers they can now finish the project. Make a circle for a head. Make hair, eyes and a mouth. 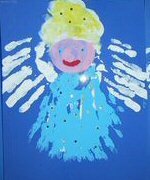 Sprinkle the angel with golden and silver stars. any colour square paper size16 x 16 cm. 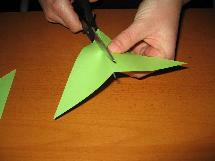 Fold a kite and fold the tip inwards. This is the dress of the angel. Cut 2 circles, 1 for the head and one for the wings. Cut one circle in half and use it on either side of the dress. 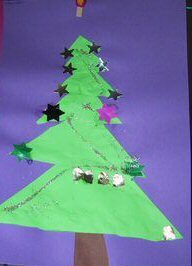 Glue everything together and decorate the project with glitter and stars. 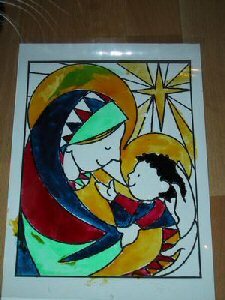 Copy the template of Mary and Jesus on transparent sheets using a printer or a photo copier. Let the children colour in the template with window paint. Hang against a window for a beautiful effect. template of Joseph, Mary etc. 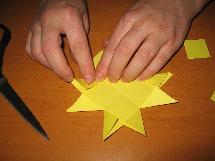 Cut one line inwards and stop in the middle. 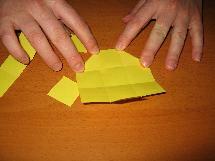 Fold the two parts that are loose from each other and glue them together. 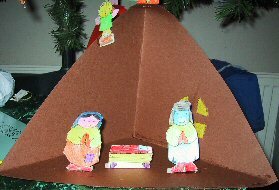 Colour all the pictures of the nativity play and put glue on the rims. 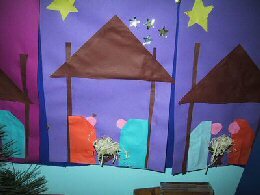 For an extra effect, let the children prick out a window and stick some yellow see through paper behind it.